Doctor Who: Four Doctors Vol. 1 Review – AiPT! 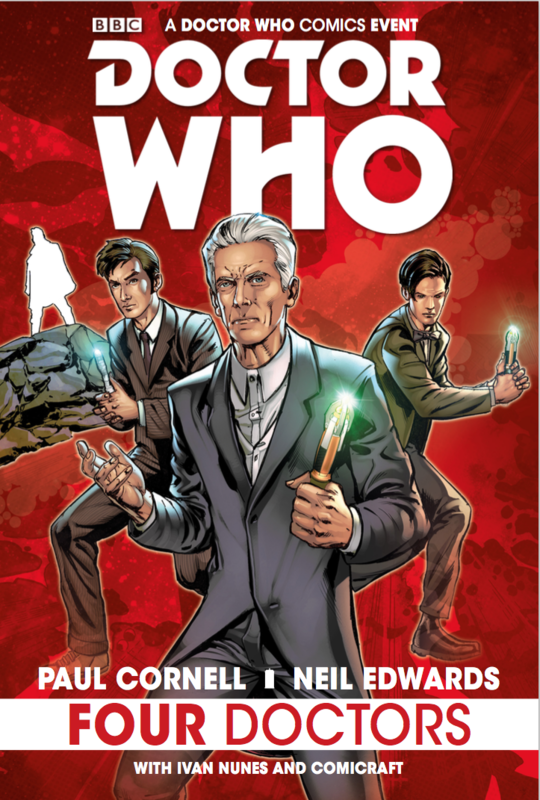 The Doctor Who series Four Doctors—a crossover event that features the 10th, 11th, and 12th doctors from their own series as they meet for a five part story— has been collected into one volume. It’s always interesting when the Doctor Who universe has the current Doctor and his past incarnations meet each other, but is it good? ​The story starts with three of the Doctor’s companions finding out about a universe ending event and their efforts to keep the Doctors from meeting, which is the catalyst. Of course, if this worked we wouldn’t have a story. Instead the Doctors find they have to choose between three possible futures. They’re all rather terrible and show each Doctor what type of decisions they are truly capable of. ​It’s always fun, if not rare, for fans of the series to see the different personalities of the Doctor play off each other, and this is no different. I imagine it’s hard to find the right balance of how long to make the introductory phase without gobbling up to much of the page and still be able to please the fans who are here to see their favorites bounce lines off each other. Four Doctors handles it fairly well—the main narrative is never lost, though it does feel a bit crowded at points as they try to give equal time to each Doctor and companion. The main climax of the series is great and puts the Doctors in a seemingly hopeless situation. The fact that the resolution isn’t obvious helps push the reader along to see what happens next and sets a good pace. ​The art is on par with the individual Doctor Who comics. There is a brief interlude after each chapter of Sunday comic-inspired Doctor Who strips that are both cute and in some instances flesh out bits of the story. A fun story and good pacing make this a great Doctor Who tale. There are a lot of callbacks to the TV series though a few, like the Weeping Angels, only make sense if you have some reference point. Otherwise, this is a solid sci-fi story that keeps the character and tone of the show intact.